This is a mod that allows you to hatch previously useless dragon eggs. Once fostered and tamed, they'll be your faithful companion in all situations and, of course, can be used for a ride! Fixed a NullPointerException in EntityAIDragonCatchOwner. Dragons will fly together with their owners that glide with Elytras. Forest dragon now produce green grass again and improved performance of the footstep algorithm. Added custom dragon egg block, which has variants for each dragon breed and is also selectable from the creative inventory (the vanilla dragon egg block behaves like an "Ender" breed egg). Reworked dragon entity movement code to fix some oddities when flying. Flying dragons now use proper A* pathfinding like on ground. Improved dragon controls, which are now more intuitive and consistent when switching between flying and walking. Removed dragon control keys R and F. Players can now control the dragon with the normal movement keys. The carrot on a stick no longer has any effect on the dragon flight controls. Forest dragons now also leave a trail of mushrooms on dirt and flowers on grass. Dragons no longer follow their owner in close range. Instead, they try to stay in a larger area around their owners unless they're leashed. Removed broken "global" chat command parameter (commands still are global when issued from the server console). "/dragon tame" now accepts an optional parameter to set the name of the new owner. 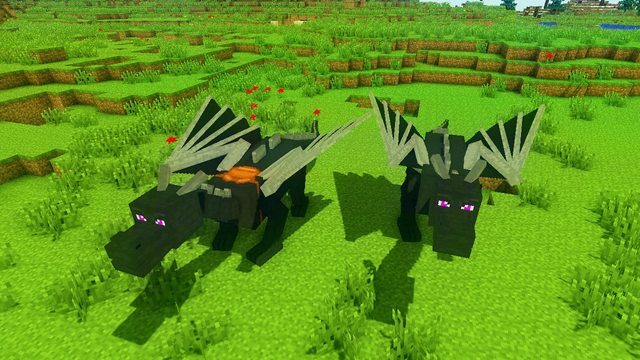 Fixed baby dragons not being classified as children by Minecraft correctly and being saddleable and ridable as a result. Fixed some dragon sounds played with the incorrect pitch and/or volume. Fixed wrong server proxy class path, which caused a crash on dedicated servers. Fixed dragon age not loaded correctly from NBT. Fixed issues with Polish and Korean translations. Slightly reduced dragon collision box size. Special thanks to TheGreyGhost for the help to port the code to 1.8! Fixed incorrect landing AI, causing dragons to fly to the wrong coordinates. Fixed a potential memory leak in the packet handler. Added breed textures for the eggs. Fixed a UUID bug when setting and checking the owner of a dragon, causing the dragon to be unresponsive for some commands. Fixed some bounding box anomalies (eggs floating below ground, sudden teleports, etc.). Improved compatibility with iChun's Morph mod. Fixed IllegalStateException when other mods (e.g. CraftableAnimals) read NBT data from dragon entities on client side. Fixed walking animation speed for non-adult dragons. Added "tame" chat command for admins to tame dragons directly. Fixed another entity exception on dedicated servers. Added config file option to override the entity ID of dragons. Fixed entity exception on dedicated servers. Added forest dragon (thanks to Venomari245 for the textures). Fixed reproduction limitation and increased limit to two. Fixed a server crash when changing ghost dragons to different breeds via chat commands. Fixed an error when using non-global chat commands while no dragons are nearby. Fixed tamed dragons with foreign owners in single player. Fixed positioning errors in some situations for players mounted on dragons. Fixed even more AI navigation bugs. Increased minimum distance before dragons teleport to their owners. Dragons no longer try to catch their owner in creative mode. Dragons are now generally immune to damage from cacti. Using a new rendering system for dragon egg entities that is independent to vanilla code and resources. This should fix some texture bugs when using additional mods and resource packs. Using a new non-invasive method to override the vanilla dragon egg block. This should fix the block warning message after installing (There will be one more warning after updating, though. Just confirm it as usual.). Fixed crash when pressing custom keys while no world is loaded. Fixed path casing issue when loading the localization strings on the server. Dragons now won't teleport to the owner anymore when sitting. Simplified version numbering, using a single increasing number for each release. Added ice dragon (textures by simocarina). 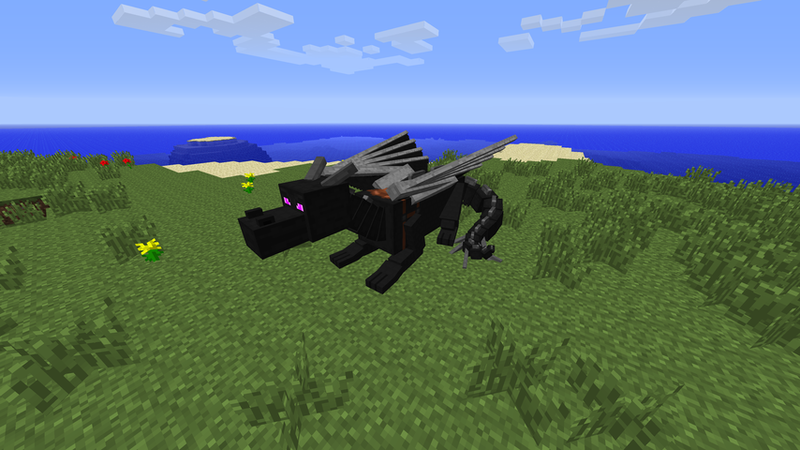 Added nether dragon (textures by Alexxx999 with modifications). Added custom key bindings to fly up and down when riding dragons (default: r and f). Dragon controls on ground are now more similar to player controls. Dragons are now limited to reproduce once only to prevent excessive farming. Dragons now follow their owners again while on ground. Dragons now try to catch their owners when they're falling. Aether dragons now fly slightly faster than other breeds. Fixed various AI navigation bugs. Fixed unsuccessful unmounting attempts when right-clicking on dragons while mounted. Fixed dragons not casting shadows. Enchantments are now applied correctly to the attack damage and health of dragons. Fixed a crash on dedicated servers related to dragon egg blocks. Dragons will now land when left unmounted in air. with the new default dismount key and other problems. Removed renaming GUI in favor of the new name tag item. Improved and extended server commands. Dragons can now be duplicated with the monster egg in creative mode. Dragons now grow continuously instead of blowing up instantly. Fixed server log spam when breeding dragon eggs. Fixed leaking worlds and player entities when switching to a different world, which caused some entity anomalies and performance issues. Dragon breeds are now sensitive to the surrounding biome. Ghost dragons now must also be sheltered from sunlight to hatch from eggs. Eggs now produce particles to indicate the current breed. Fixed breeding environment data not being saved. Fixed collision box size for adult dragons, again. Changed the way how babies inherit the breed of their parents so it becomes more resistant to environmental influences. Added four new dragon breeds. The breed of a dragon is influenced by the environment it was exposed to as an egg. Hint: the previous restrictions to place an egg is now a condition for one of the new breeds. Added config file for server settings. Created in config/DragonMounts.cfg after first run. Added option for dragon eggs spawning in chests. Disabled on default, needs to be enabled in the config. Dragons can now be renamed by right-clicking it with a book. Dragon babies now walk through open doors. The dragon's full health display is now visible for the owner only. The texture overlay is now rendered on all body parts and glows more intense. Fixed collision box size for adult dragons. Fixed unmounting cause the player to teleport through/into solid blocks. Fixed dragons sometimes looking to a wrong default direction, for real this time. This build is compiled using the new runtime deobfuscation feature, which means that it should stay compatible with any future Minecraft 1.5 patches. Dragons no longer lift off on their own until I figured out how to fix the AI properly. Instead, the dragon will now teleport to the owner more often when stuck. Fixed server plugin using client-only methods, which was causing a crash on dedicated servers. Fixed missing chat message string in ModLoader version when using dragons tamed by other players. Fixed dragons sometimes looking to a wrong default direction. Fixed dragons instantly growing up and not being able to breed. Fixed random jumping of dragons and eggs. Server commands are now available to operators only and work server-wide on all dimensions. The carrot-on-a-stick-control-mode now also works on ground. Minecraft's internal boss overlay is now used to display the dragon's health and owner. If a carrot on a stick is equipped while riding a dragon, mouse controls are enabled. Added the dragon owner's name to the overlay. Added more effects for the hatching phase. Added a message for players trying to mount dragons tamed by other players. The rider now rotates with the dragon similar to riding a pig. Implemented more of the new 1.4 sounds. Temporary disabled any suffocation damage on dragons. Dragon eggs now teleport away again when left-clicked. Using some of the new integrated 1.4 sounds. Fixed dragons not looking around while sitting. Fixed Forge metadata not being used. Dragons now have a higher chance to land after flying away randomly, especially if non-adult. Dragon eggs no longer teleport away when clicked, but also can't be mined with normal tools. Dragon eggs can now be hatched under special environmental conditions. Dragons now grow up slower. Dragons now stand up when attacked. Dragon babies now flee when attacked. Non-adult dragons now have less health points, deal less damage and make less stompy sounds when walking. Improved unmounting positioning to avoid fall damage. Fixed a server crash when healing dragons with food. Fixed heads not lowering when the dragon is hurt. Fixed some sounds being played when flying though water. The dragon's life stage is now displayed in the overlay. Activated eggs randomly jump up a few block. Added theoretical multiplayer support (server plugin not available yet). Dragons now need to be tamed with raw fish for more interaction. Dragons can't be ridden without a saddle anymore. Food items now heal with their satiation values. Items that do nothing when used on dragons no longer wear off. 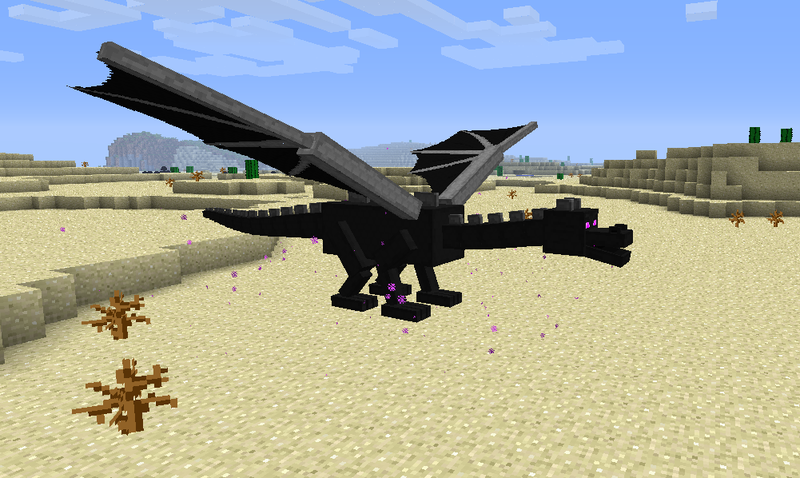 In creative mode, dragons can now be spawned with a spawn egg (black/purple color). If a tamed dragon is very far away from its owner, it will now teleport next to its owner like other pets. Fixed suffocation bug when touching a ceiling of blocks while flying. Dragons are persistend now and can no longer be transformed back into eggs. 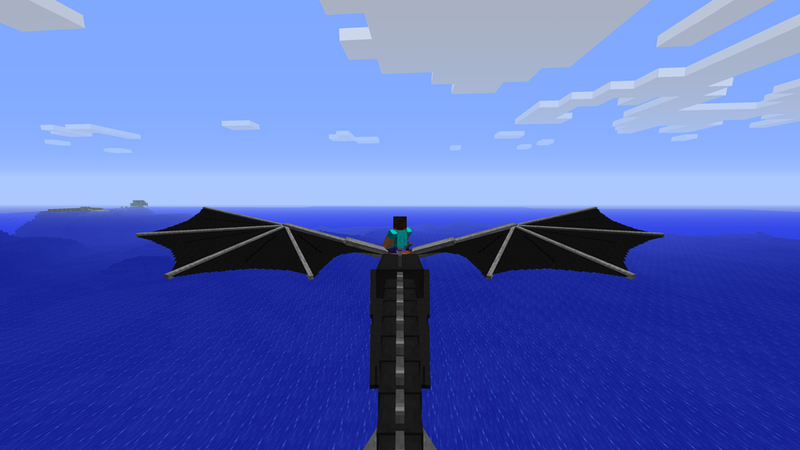 Dragons now can fly through water with reduced speed and no longer need to swim. Dragons can now look at other beings while sitting. Disabled all hitboxes except the basic one at the center of the dragon. Disabled any egg block features and changes, new dragons can be spawned in creative mode only. Added mod metadata for Forge. The third-person camera distance is now doubled when flying. Fixed dragon egg rendering bug with Forge-ModLoader. Fixed dragons not being able to swim. Fixed dragons sometimes cycling midair. Fixed initial waypoint of manually spawned dragons. Fixed weird following behavior on flat ground. Fixed dragon health bar obscuring the armor and air meters. Possibly fixed invisible dragons, invisible legs and missing walking animations. Pressing left control key while flying now enables free look. The health bar caption now tells if a dragon is "sitting" or not. Dragons can now be mounted midair. Dragons can no longer be tamed/saddled shortly after being attacked. Improved flight controls and movements. Added a simple flight AI. Untamed dragons now cycle between flying and walking. Tamed dragons now try to fly to their owner if necessary. Fixed GUI overlay not always being visible when it should. Changed leg positions so the dragon looks less "fat". Added flapping and walking sounds. Temporary disabled flame breath until some problems are fixed. Disabled projectile collision on the dragon when the rider is using the bow. Dragons now avoid water and don't try to enter doors for pathfinding. Fixed dragon water handling when being ridden. Fixed dragons stuck in air after using glistering melons while not being ridden. Fixed all dragons nearby becoming hostile if you attack one. They wander around on their own. They look at players and other dragons. They defend themselves when attacked. Once tamed, they follow their owner and assist them in battle (for now, they're tamed when you ride them first). Added body expanding and shrinking when the egg is used. Small leg proportion and animation updates. Fixed fire breath not always being removed when the dragon disappears or gets killed. Fixed incorrect friction calculation when walking on ice blocks. Fixed a walking animation error. Fixed levitating dragons when the blocks beneath are removed. More model and texture updates. Fixed some minor dragon egg bugs. The dragon's health is now saved and displayed on the egg item as well. Right-clicking a dragon won't mount/unmount you anymore if the current item has an action, such as blocking or eating. Changed default control method for walking. Changed speed control for keyboard/combined method. Dragon eggs no longer disappear when affected by gravity. Small model and texture updates. Added optional action keys that can be enabled in the config file. Added "walking" (currently without animation). The dragon's health is now saved in the egg block. Injured dragons now lower their head when grounded. Improved wings and legs on the model. Added smooth animation transitions for the neck, legs and wings. Added flame breath, activated by feeding dragons with blaze powder (lasts 5 seconds). Items are no longer consumed by the dragon in creative mode. When the dragon is transformed to an egg, equipped saddles are now added to the inventory of the rider, if possible. Fixed some AI vs. control conflicts when flying unsaddled dragons. Added some optional debug logging messages. Dragons won't damage their riders anymore. Dragons can now lift off using the jump key. Dragons can now be healed by feeding it with raw fish/chicken/beef/porkchop (4 hearts) or rotten flesh (2 hearts). Dragons now get a terrain destruction aura for 10 seconds when fed with a glistering melon (only when saddled, effect can be stacked). You can now control the speed with the forward/backward keys. Added a few chat messages for guidance. Using the dragon egg while holding a saddle now automatically saddles the spawned dragon. The egg will now launch you into the air only if you activate it with a saddle. Otherwise, it spawns an unsaddled dragon on the ground. Added a less spectacular death animation. Improved particle emitter for dragons. Changed saddle position from back to shoulders. Improved player positioning when flying straight up or down. Dragons won't infinitely bounce off the water surface on ocean biomes anymore. Fixed first flight target coordinate always being [0, 100, 0] when uncontrolled. Fixed dragon eggs emitting too much light. You can now saddle dragons with the saddle item. Unsaddled dragons can be controlled by height only. The saddle will be dropped when the dragon transforms back into an egg. Dragons are now hydrophobic and won't submerge in water. Dragons won't take damage from their riders anymore. You can now unmount from a flying dragon egg at any time. Dragon eggs won't damage the terrain anymore. Dragons can now be hurt from all types of damage, including attacking each other. The egg will now check if there's enough room for the dragon to spawn. Holding another dragon egg while riding a dragon will now enable the noclip mode (an overlay similar to charged creepers will be visible). Improved unmount positioning to avoid fall damage. Projectiles and other damage sources are now registered correctly on all hitboxes. Projectile collision detection is now disabled on the dragon when the rider is using the bow. Turned off body particle effects (on request ). More texture and model improvements. Optimized renderer: less flickering on far distances and the performance should be better when rendering lots of dragons. 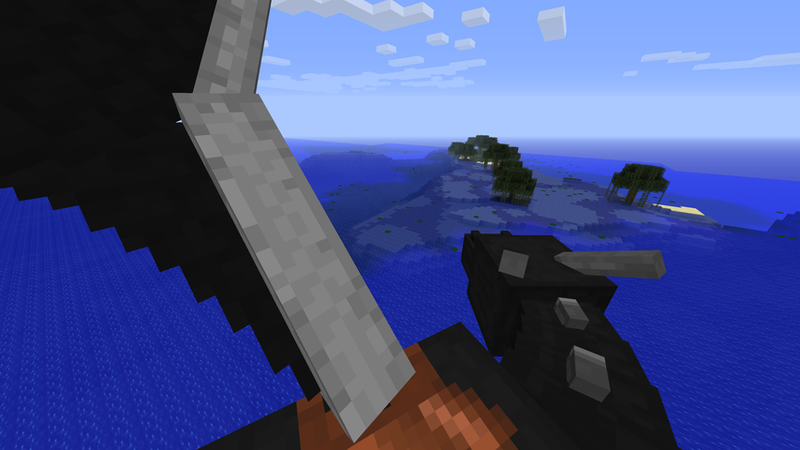 Added saddle overlay (doesn't require the saddle item to be used right now). Grounded dragons will now fly away when hurt and land somewhere else. Reduced flight speed to match the speed of terrain generation. Reduced hitbox size for terrain collision. Fixed possible conflicts with other ModLoader mods. Fixed incorrect rendering of flying dragon eggs in the ModLoader version. Fixed a problem caused when dragon eggs are being used while connected to a server. Ridable dragons are now independent entities with their own model, renderer and textures. 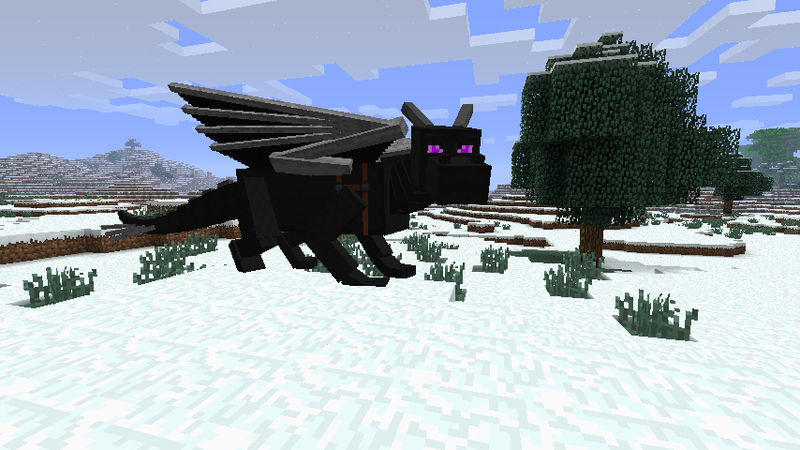 For now, the original Ender Dragon won't receive any of the changes for compatibility reasons. 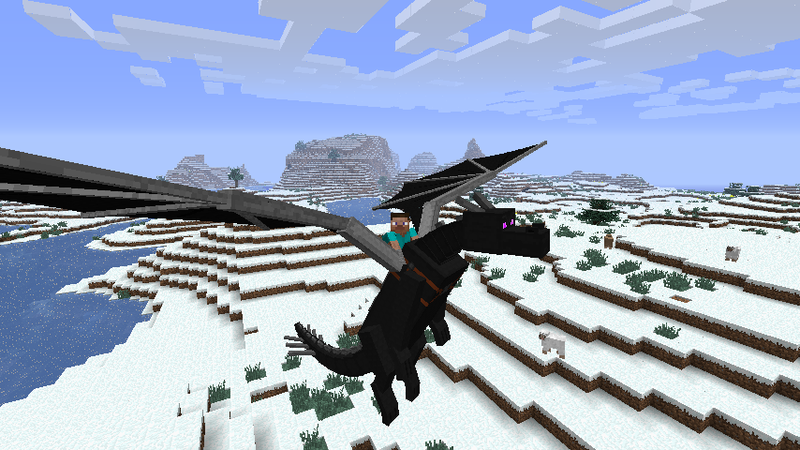 Ridable dragons are now slightly smaller than Ender Dragons and have less health points. You can now land on the ground. Look up to lift off again. It's a bit stiff and glitchy right now and may look weird on uneven ground. You can now mount/unmount while the dragon is grounded. Ridable dragons won't drop an "Ender Well" and tons of exp anymore when killed, for obvious reasons. The riding state is now saved when exiting and entering the world. More model improvements and a new idle animation. You can now mine dragon eggs like normal blocks. Ender Dragons and their eggs now emit purple particles, similar to Endermen. Ender Dragons phasing though the terrain now generate hissing sounds. Small updates on the dragon model, e.g. smaller hind legs so it looks less like Godzilla. Dragon eggs are now available in the Creative Mode block selection. Note: this mod is still in beta stage and has known and unknown bugs. I'm not responsible for the possible loss of dragon eggs due to bugs. Test this mod with care! Move the Zip/Jar file in the "mods" directory inside your .minecraft directory. To hatch a dragon egg, you'll need to find a good place for it first. If you found one, place the egg block and simply right click it. The egg will then start to hatch, which will take a while. Q: Is there going to be dragon armor? And when? A: I don't know yet for sure. It heavily depends on the reusability of the inventory code of the horses, which is quite bad in the moment. It may improve in the future, though. Q: Dragons need to breathe fire! When are they going to do that? A: That could happen within the next few releases. enter the chat command "/give dragon_egg". Q: I tamed a dragon in singleplayer, but when I now try to interact with it, it says "This dragon doesn't follow your commands". A: This could be an unresolved bug. As a workaround, you can use the chat command "/dragon tame" to reclaim the dragon. Q: I'm a huge fan of ! Can you add for me? A: This mod is supposed to be fandom-neutral so it's suitable for everyone. This also ensures consistency with Minecraft's look-and-feel. Therefore, I can't fulfill these special requests, sorry. holy ­, this mod looks so ­ing amazing ! I'm going to try this right now ! Not liking how it edits so many base classes though. Love the mod, just one suggestion though, maybe a way to stop and land ? Well, right-clicking the dragon is currently the only way to stop and land. Animations for land movements would be nice, but are probably very difficult to implement, at least if it's supposed to look as good as flying. And yes, it modifies some original classes, but mostly those that are related to the Ender Dragon and the egg. An upcoming Modloader version should resolve the conflicts with other mods. For me all it would have to be is the dragon falling down to the floor, and just standing, i don't think it would have to be as nice as the flying, as long as i can put it in my backyard, it's all good :tongue.gif: . Hehe, my expectations aren't that high. It's not something groundbreaking yet (well, game-breaking maybe :iapprove:). Well, not many people look through the WIP section much, ( good thing i did :tongue.gif: ) but once you put this into the Released mods section, a lot more people will look at this. trust me. Awesome, so when's v2 coming out, and how would i be able to land ? Just fly towards the floor or ? Wait, does that mean you updated it already ? If so you should probably change the Download in the OP , cause it still says v1. No, not in 0.1, it's for the next version.